To light fireworks at arms length with the portfires provided. Never to smoke while handling fireworks. Not to have more than three or four people lighting fireworks. Not to fire rockets or other aerial fireworks over the heads of spectators. Not to allow people to bring their own fireworks (including sparklers). Not to touch a dud firework for at least half an hour and then hold it away from your face. Never to use petrol or paraffin to light the bonfire. Not to let children gather spent fireworks after the display. Not to let any unauthorised people into the firing area before or after the display. Make sure the bonfire is out completely and the site left in a safe condition. These are normally a tube or a volcano, but they can be multiple units fused together in a much larger package. They can emit crackles whistles or showers of sparks. Usually inserted upright in soft earth but can be tied to an upright stake. The golden rule is not to allow them to fall over. These are fireworks that need attaching to a post or posts. They can be static devices or spinners or a combination of both. Fireworks such as Display Waterfalls or Flying Pigeons need two posts and the rope between the two should be under as much tension as possible. Take care that sparks from these devices do not ignite other fireworks and vice versa. A long thin firework that projects a number of stars or effects into the air. Roman candle bouquets are a number of candles angled on a frame and barrages, bundles and cakes are a number of candles fused together for single ignition. Usually roman candles are inserted upright in soft earth but they can be tied to an upright stake. The important thing is to make sure they are stable and that they will not fall over. Angle them slightly away from spectators and ensure there are no overhead obstructions. These are usually a pot with a large projecting fuse as in a Jack in a Box, and are inserted upright in soft ground prior to firing. They can also be very powerful mines ready loaded into mortar tubes which need to be buried to 2/3 their depth. After ignition mines erupt dramatically with stars or effects straight from the pot or tube. Mines, especially mortar mines are dangerous if misused. Please read all instructions thoroughly. A familiar firework consisting of a motor and head on a long stick. The motor propels the rocket high in the sky where the explosion releases the stars or effects. Rockets must be fired from a tube or rack placed at the rear of the display. Angle slightly away from spectators, make sure there are no overhead obstructions and ensure there is a safe area for the spent rockets to land. Not strictly a firework these long thin devices with a touch paper fuse are for lighting fireworks with. On ignition they burn with a stab of flame lasting 4/5 minutes so that you can safely light the fireworks at arms length. Most groups now set up a small organising committee to administer the event. Try and get at least one member experienced in firework displays. Clearly define the duty of each member of the committee, for example one person could be responsible for the ordering storing and lighting of the fireworks, another for liasing with local authorities, police, fire brigade, another for site facilities and crowd control and so on. Fireworks International have experienced staff on hand who can offer help and guidance and can also provide a really useful video of how to do it. Additionally HSE produce a useful guide HSG 124 ‘Giving Your Own Firework Display’. Fireworks International have also negotiated with their insurance brokers to provide you our customers with basic third party cover at a very competitive rate, so take advantage of this very special offer and fill in the form provided. Your site should ideally look like the diagram on the site safety page. Pay particular attention to the wind direction and if at all possible have an alternative arrangement on site if the wind changes. If you decide on a bonfire make sure that it is at least 15metres from buildings roads, railways and other public rights of way, clear of overhead obstructions like power lines and is a safe distance from petrol, fuel oil and gas installations. 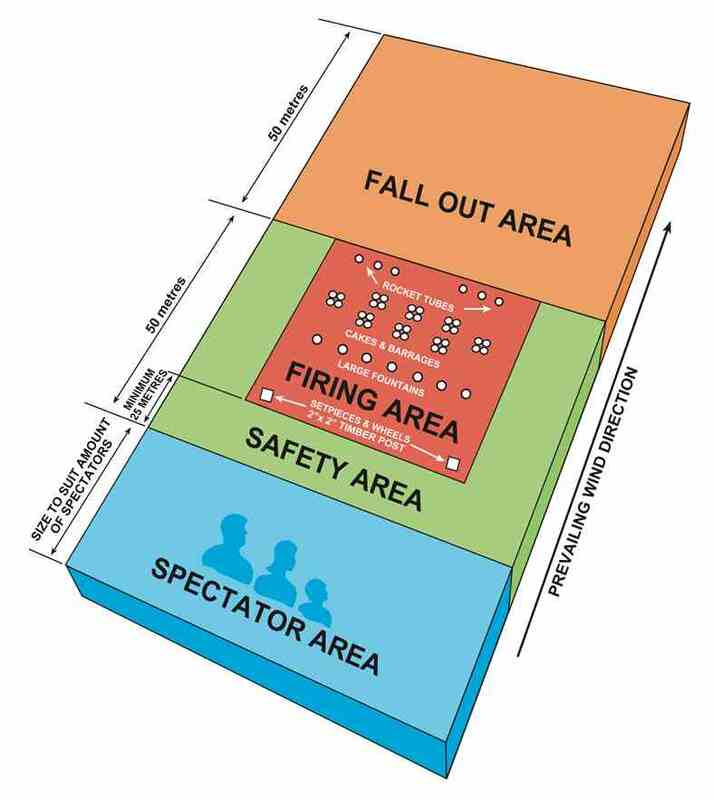 Prevent access of spectators to the safety, fall out and firing areas by some suitable fence or barrier. Try and provide an adequate number of clearly marked stewards. Do not allow spectators to bring their own fireworks including sparklers. Make sure there is equipment available for putting out small fires (extinguishers, water, fire blankets). Well before the day draw up a plan to cover what could go wrong on the day. define and agree ‘What action will be taken’ and ‘Who will take the action’ Here are some likely problems:-wind direction, accident from firework injury, bonfire unsafe, disorderly spectators. When the fireworks arrive check to see that they are all there and that you can see no obvious problems. Repack them into the card boxes and store in a cool dry place until needed. It is strongly recommended that firers read the instructions on the fireworks and examine the fireworks in advance to make sure they understand and can proceed with the firing safely. If any more information is required remember Fireworks International have expert staff on hand to deal with your enquiries. Form a firing plan for the team to follow, basing the site layout closely on the site diagram. Remember it can rain on the day and polythene bags are almost essential to protect the fireworks. They can be quickly and easily removed immediately prior to lighting. Only allow the firers into the firing area and restrict their numbers to the minimum possible to ensure continuity of the display. Firers should wear suitable clothing. A protective hat, goggles and ear protection are advisable with cotton overalls (or another non flammable material) Do not use thin nylon. Always use portfires to light the fireworks at arms length. Never lean over a firework. If a firework fails to ignite then leave it well alone for at least 30 minutes. Keep the firing area clear of spectators until the firers have had time to clear up. Locate and deal with any dud fireworks. These should be soaked for 24 hours to make them harmless. The spent fireworks should be collected into refuse sacks for disposal. Ensure the bonfire has been completely extinguished. It is a good idea to return to the site at first light next day to make a final inspection. Intending organisers of public or semi public displays should be aware of the requirements of the Health and safety At Work Act 1974 which applies not only to the safety of those directly involved but also to the safety of members of the public. This leaflet is intended only to provide basic guidance, compliance with its recommendations is not necessarily sufficient to meet responsibilities placed by the act on those who involved in firework displays.